New York is a metropolis where residents take pleasure in walking from neighborhood to neighborhood, exploring the plethora of sights and sounds the city has to offer. 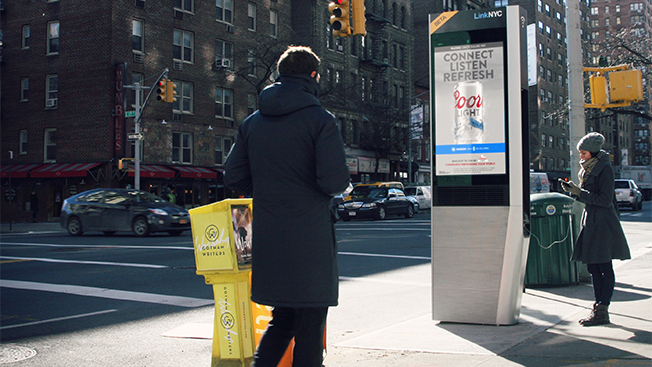 In the coming weeks, New Yorkers can add a bit of digital music to their adventures, courtesy of Coors Light, which is testing interactive ads via tech-enhanced kiosks in several Manhattan sidewalk locations. Teaming up with music-identification app Shazam and out-of-home marketing vendor Intersection, the MillerCoors brand is mining data about which artists the folks in NYC's downtown and midtown neighborhoods are listening to in order to create real-time playlists. 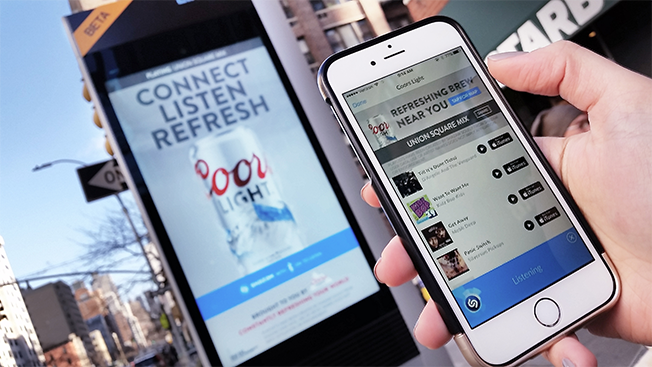 Earlier this week, passersby started approaching Coors Light-branded kiosks—adorned with the copy "Hear the Street's Playlist"—that let them download the local mixtapes. To hear the lists, which consist of 10 tunes, consumers need to open the Shazam app at a location and tap a "Listen" button. The lists will vary neighborhood by neighborhood due to the differing musical interests in Union Square, Gramercy, Murray Hill, Hell's Kitchen, Chelsea, etc. The collections of songs are refreshed every 15 minutes based on updated Shazam search data for the endeavor that will last one month. Josh Wexelbaum, senior manager of local/shopper marketing for MillerCoors, said consumers are starting to expect real-time utility from brands. So combining an old-world concept like out-of-home advertising with a new media player such as Shazam makes sense. "It's not about digital marketing anymore," Wexelbaum said. "It's about, 'How do I market in the digital age?'" Greg Glenday, Shazam's chief revenue officer, said that music-bolstered "kiosks and [out-of-home promos] are a perfect execution" when it comes to reaching the smartphone-obsessed populace of today. "It allows us to have a deeper connection with customers," Wexelbaum added. If the limited effort proves successful, the MillerCoors exec said, the brand would "absolutely" consider rolling out the concept to other major U.S. markets.